This blog series is focused on different methods to evaluate and reduce energy consumption of buildings. The demand for energy is increasing at an alarming rate and the building sector is one of the largest consumers of energy; gaining more and more prominence over the past few decades. Retro-commissioning is a proven process to help combat this problem. Let’s start with a quick overview of what building commissioning is. A research study on commissioning and retro-commissioning performed by Lawrence Berkeley National Laboratory in 2009 found that the average retro-commissioning project cost $0.30 per square foot with energy savings of 16% and with a simple payback of 1.1 years. Which brings us to the glaring question, why isn’t everyone doing this? Some possible reasons could be unfamiliarity with the retro-commissioning process and fear of any upfront costs. In order to overcome these hurdles, many cities across the nation are recognizing the importance of retro-commissioning/energy audits and are developing legislation that makes it a mandatory procedure. For example, New York City has developed PlaNYC, an agenda to meet energy challenges to building a greener, greater New York. Included in this plan is Local Law 84: Benchmarking and Local Law 87: Energy Audits and Retro-commissioning. In my next blog, I will discuss these laws in detail. Do you have any questions regarding retro-commissioning? Drop me a line in the comments section below! 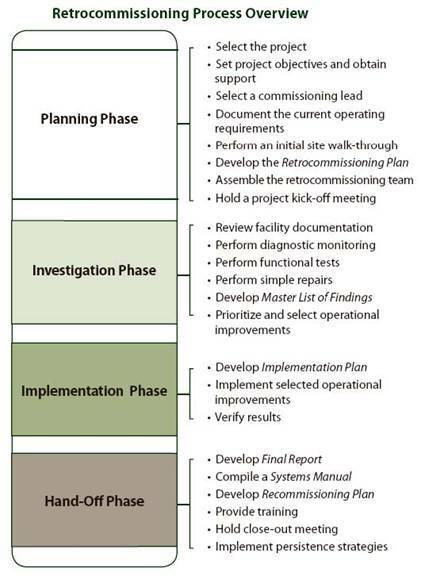 In my last blog, I provided an overview of the energy audit process. I highlighted the importance of energy audits and want to further this discussion by exploring the topic of benchmarking. Due to rising energy cost and the negative impact of burning fossil fuels, legislators have been demanding, in addition to energy audits, benchmarking. The benchmarking process creates a baseline of comparison for buildings in order to accurately set energy performance/sustainability goals that are specific to your facility, such as reducing overall energy or water usage. Benchmarking your building’s performance will show you how the energy performance of your building compares to other, similar buildings. This process involves tracking a building’s energy and water usage and applying a standard metric to compare the building’s performance against past performance and to buildings of similar stature. This information allows us to identify the energy intensive buildings, set energy and cost saving priorities and monitor progress. With cities growing at alarming rates, energy demands are skyrocketing. NYC has stepped up to the challenge and is a proven frontrunner for energy legislation, including benchmarking. New York City’s largest buildings, just 2% of roughly 1 million buildings, account for 45% of the energy expended. Building a better, greener, greater New York City starts with Local Law 84 (LL84); which was signed into action in 2009 by Mayor Bloomberg. This law mandates annual energy and water benchmark reports for privately owned buildings over 50,000 square feet. Since the enactment of LL84, California and Washington State have instituted statewide requirements for benchmarking in cities such as: Austin; Philadelphia; Washington, D.C.; Minneapolis and Boston. Cities across the United States are jumping on the benchmarking movement every day in a fight to reduce buildings’ energy consumption. Building owners and operators often do not have access to basic information on how their building performs. If building owners and operators obtain this information, it can be difficult to interpret it accurately. Misinterpreting the numbers can be very misleading. Another difficulty is comparing your building to other “similar” buildings. Do you compare your building against one of similar size, but the building use is different? Factors such as facility size and occupancy information, vacancy data and number of computers used can all manipulate data. How can one make an accurate comparison? The key to accurate benchmarking is the activities of the end users. Another key factor is communication. Facilities operators and owners must clearly articulate the goals of benchmarking their building, so that intentions are understood from the start. There are several motivations behind benchmarking, the main reasons given by facilities professionals for benchmarking according to the Lawrence Berkeley National Laboratory study in 2007 are as follows: a) to identify energy-efficiency opportunities, b) to prioritize investments, and c) to make comparisons to other facilities. Data presentation should explain findings clearly; what you were investigating and what you found. Once you have your benchmarking data, it will help to identify why and where a building is losing energy and where and how you can save energy. A tool that can help includes the newly upgraded EPA Energy Star Portfolio Manager Benchmarking Tool. Read about it here. What Type of Energy Audit Will Produce Accurate Benchmarking Data? In my next blog post, I will discuss the building technology society founded in 1894 known as the American Society of Heating, Refrigerating and Air Conditioning Engineers (ASHRAE). This professional association focuses on building systems, energy efficiency, indoor air quality, refrigeration and sustainability within the industry. I will explore what ASHRAE’s standards and guidelines are for energy auditing in my next post. Do you have any questions regarding benchmarking? Leave me a comment and I’ll be sure to address them.